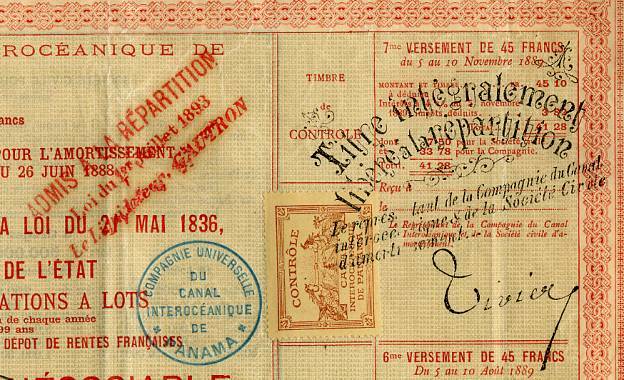 Beautifully printed certificate from the Compagnie Universelle du Canal Interoceanique de Paname issued in 1888. This historic document was printed by Imprimerie Filigranique and has an ornate border around it with various control stamps on the front. Signs of wear. This item is hand signed by the Company's President-Director, administrator, and the printed signature of Ferdinand de Lesseps. Reparations Stamp in red dated 1893. Among the great peaceful endeavors of mankind that have contributed significantly to progress in the world, the construction of the Canal stands as an awe-inspiring achievement. The unparalleled engineering triumph was made possible by an international work force under the leadership of American visionaries, that made the centuries-old dream of uniting the two great oceans a reality. In 1534, Charles I of Spain ordered the first survey of a proposed canal route through the Isthmus of Panama. More than three centuries passed before the first construction was started. The Geographical Society of Paris organized a committee in 1876 to seek international cooperation for studies to fill in gaps in the geographical knowledge of the Central American area for the purpose of building an interoceanic canal. The committee, a limited company, La Soci�t� Civile Internationale du Canal Interoc�anique de Darien, was headed by Ferdinand de Lesseps whose signature is printed on these bonds. A congress, the Congr�s International d'Etudes du Canal Interoc�anique (International Congress for Study of an Interoceanic Canal) was planned to take place in Paris on May 15, 1879, with invitations sent out by the Soci�t� de G�ographie (Geographical Society) of Paris. The congress believes that the excavation of an interoceanic canal at sea-level, so desirable in the interests of commerce and navigation, is feasible; and that, in order to take advantage of the indispensable facilities for access and operation which a channel of this kind must offer above all, this canal should extend from the Gulf of Limon to the Bay of Panama. Unfortunately for the French, the canal was a major financial failure. The French labored 20 years, beginning in 1880, but disease and financial problems defeated them. The effort lost over 20,000 men and cost over $287,000,000 or 1,435,000,000 francs. The French company was the greatest business failure of the 19th century. 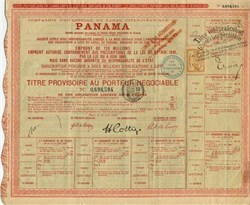 In 1903, Panama and the United States signed a treaty by which the United States undertook to construct an interoceanic ship canal across the Isthmus of Panama. The following year, the United States purchased from the French Canal Company its rights and properties for $40 million and began construction. The monumental project was completed in ten years at a cost of about $387 million. This historic certificates will make a nice addition to your collection or a terrific historical gift for someone special.